I don't know about you, but gifts are my love language. I love giving them, I love receiving them, I love wrapping them with cute handmade wrapping paper... I will also never stop being grateful that people buy my jewelry to give as a gift! I could insert a "#blessed" tag here but I'll spare you. #yourewelcome But seriously, making a living off of my craft is still amazing even after 9 years. 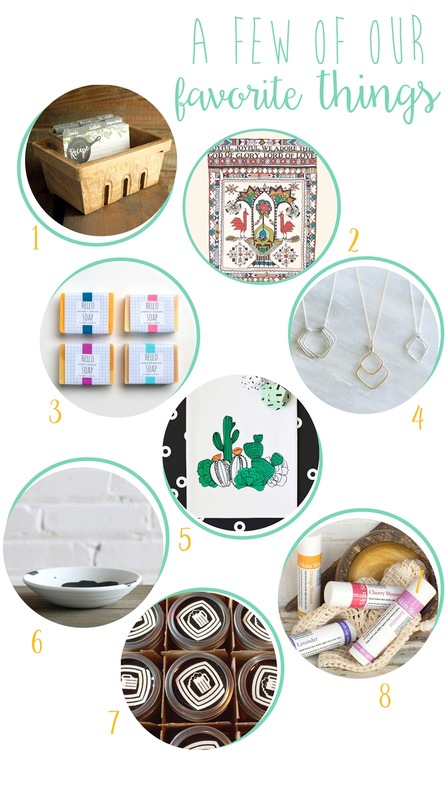 In the spirit of the ultimate gifting season, I pulled together a little list of handmade goods for your giving inspiration. These are all items created by makers I personally know, so trust me that you're supporting amazingly awesome people when you purchase any of them. 1. 1Canoe2. I'm friends with this bunch, and I can never get enough of their hand painted designs and fun paper products. This Berry Basket Recipe Box is perfect for people who are starting to discover their cooking potential! Co-founder Beth Snyder used to live in Nashville - she and I actually met at the American Artisan Festival! 2. Little Things Studio. My gal Kate is amazing at transforming words into a work of art. It's hard to choose, but we happen to really like this one. Kate and her husband just bought their first house in East Nashville and their renovations have been epic! 3. Hello Soap. You could always keep the gift-giving clean and go with some handmade soap! My production assistant Britt has all the smell-good soaps and lip balms you need. In fact, we couldn't pick a favorite scent, so we're betting this set of four citrus soaps would be a crowd pleaser. 5. Pine Street Makery. Who can resist a lovely hand printed tea towel? And aren't tea towels with hand illustrated succulents on them even better? My production assistant Jessica has a knack for quirky illustrations which she prints on totes, tea towels, and more. 6. Corbé Company. I discovered this modern ceramics duo at Renegade this fall. I'm smitten with their pinch dishes and have already given several as gifts! 7. Clawson's Pub & Deli. If the men in your life are anything like the men we know, they love craft beer. And Clawson's serves up a rotating selection of them which you can give in the form of a gift card or inside a growler! Ann & Jens Clawson moved here from California to pursue their dream of opening up a restaurant, and I'm so glad they landed in my studio building, because they're awesome and you know, beer down the hall. 8. Rinse. My friends at Rinse have everything from beer soap (another guy gift!) to wine soap (mom gift!) to pet wash (dog gift! ), but we picked this little Bouquet of Skin Sticks from their personal care arsenal. Heather started Rinse after finding that she had a knack for soap making, and she now operates an entire Rinse Store in Monroe, Georgia with her husband, son, and now a newborn baby! Well, those are some of my go-to presents! Do you have any favorite things you'll be wrapping up for your loved ones with this season?